Are you visiting our state, or a resident looking for a "stay-cation," and want to have a great time learning a bit about Michigan's role in the Civil War? This page will help you do that. 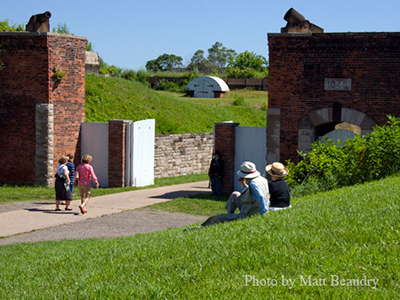 Historic Sites - Visit a local historic site. Often the best way is to find a museum or site close to where you are. It's usually less expensive and you'll learn more about the area. Find out more in the Historic Sites page. Museums - Musuems provide a place to see a collection of Civil War items. Learn more about Michigan's Musuems with Civil War collections displayed in the Museums page. State Markers - In addition to sites, there are many places across the state where historic markers have been placed. Several of these relate to our experience in the Civil War. Learn more at the Markers page. Monuments - Before the state had a central historical marker project, many communities and veteran's associations erected their own monuments for the men who served. Learn about where to visit these many monuments on our Monuments page. Battle Flags - Visit Michigan's Civil War Battle Flags. Housed at the Michigan Historical Musuem, they are a great collection of treasured banners which the men followed into battle. Learn more about Michigan's battle flags in our Flags page. Battlefields - The men lived here but the fight was in the South. Go to the Battlefields page to find an ever growing set of links to see the Michigan markers and monuments placed where the men fought. Either use these pages as a virtual trip or, better yet, as a guide as you plan your own vacation to see some great American sites! Maybe you are looking for a little more active event than a museum. Check out our Calendar for what is happening when you want the experience.